A Shepard-Risset Glissando is a set of three musical scales, separated by octaves, played simultaneously to produce the auditory illusion of notes forever ascending (or descending). The effect isn’t ethereal so much as it is unnerving, because the layered scales never resolve. Songs and symphonies teach us to expect resolution. Melodies are boomerangs and hungry dogs: they always return. An ascending Shepard-Risset Glissando, instead, builds tension and anxiety to the breaking point—but without ever breaking. Composer Hans Zimmer loves Shepard tones. And it wouldn’t surprise me in the least to learn that Dani Couture does as well. 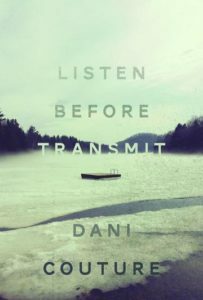 Listen Before Transmit (Wolsak and Wynn, 2018) her fourth book of poetry, never resolves—not even close. It only ascends. By the time you’ve reached the third and final untitled section of Listen, you’ve somehow made it to the outer atmosphere in a weather balloon: all the Earth you know reduced to miniatures, and space incomprehensibly massive above you. That said, Couture’s verse originates not in the ionosphere, but from the jagged surface of the Earth, where the air is heavy, thick, and full of contradictions; where “everything can and will happen at once” (3:7). Listen begins by wading into deep material ironies and paradoxes: “Inverse peak[s]” pull the landscape inward (1:14) and the pliant bodies of “the dead become firmer” (3:18), while “the universe tr[ies] to both see and collapse into itself” (14:8). But neither does Listen collapse—it oscillates and threatens. The centre Couture gives to Listen is a kind of fulcrum: a pivot point balancing ontology, origin, loss, and mythos—memories “buried / by one animal and dug up by a double” (21:3-4). In “A Brief History,” the artifacts of the Apollo program, in all their complex familiarity and distance, leave us with only “a single road trip / we based our entire lives on” (25:18-19). Memory is not only vulnerable to entropy, but enables it, Couture warns: “How many times / have you lit the kettle’s coil to leave it cold?” (29:6-7). The heat death of the universe; chaos and elegant decline. Though the Shepard tones playing in Listen’s background always ascend, the sensation of “hurtling through space or sea” (60:1) holds the promise of eventual descent. In her book’s final pages, Couture releases to us questions of scale, size, distance and density. The sky on any given night, with its million-year-old points of light, may be “the universe’s oldest Polaroid” (44:3), but the “directive / must be completed” (61:4-5). Listen Before Transmit’s directive is nothing less than the revelation of immanence through the illusion of transcendence: ascent as the revelator of decline.